Read 2 times. Last read May 24, 2017. I re-read this book for our June topic of refugees with #yearofya, join our twitter chat at 8pm Tuesday May 30. It took me awhile to get around to reading this book, but I was determined since it was listed on 2010 Best Books for Young Adults...All of the characters were important, even Shanelle and her gang as Griffin tells of harsh urban life in the Bronx, where three people's lives intersect, they become friends, and the environment just crushes people. I want to say this book has a redemptive ending, but it falls a short---but that is just life and Griffin wants us to know about living on the mean streets of an urban, decaying city. Each chapter covers one of the friends; Jimmi Sixes is a schizophrenic war veteran who has love in his soul for poetry and the beautiful artwork of Tamika and Fatima. Tamika is hearing impaired and uses a bad set of hearing aids which she likes to "turn off" rather than listen to the loud, nasty insults and jeers of those who taunt her. Fatima is fresh off the boat from Africa where she has lost most of her family and she knows she has to be almost invisible to stay off the radar of the immigration police. Jimmi befriends Fatima, gets her a volunteer job at the veterans hospital when she is not selling newspapers and introduces her to Tamika. It is true friendship that develops between Fatima and Tamika. But Tamika is taunted, pushed and chased by bully Shanelle and she gets more and more in her gang to "take care of Tamika." Fatima meets her at school and walks her home but life is about to take an even nastier turn. For a look at real life on the streets of New York, Griffin's book does not disappoint. 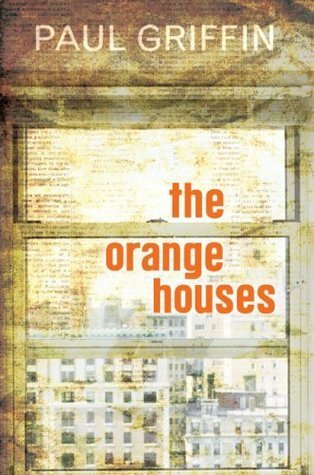 Sign into Goodreads to see if any of your friends have read The Orange Houses. curious on what you think on this one! I really liked it, but I am not sure how many would jump for it if I booktalked it---maybe a digital book trailer? The reluctant readers would like the thin book but advanced readers wouldn't necessarily read it- but they would understand the issues. What did you think?